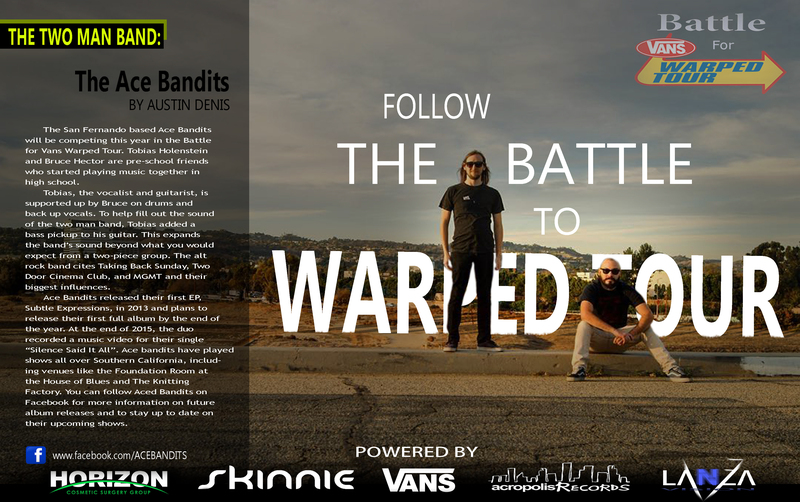 The San Fernando based Ace Bandits will be competing this year in the Battle for Vans Warped Tour. Tobias Holenstein and Bruce Hector are preschool friends who started playing music together in high school. Tobias, the vocalist and guitarist, is supported up by Bruce on drums and back up vocals. To help fill out the sound of the two man band, Tobias added a bass pickup to his guitar. This expands the band’s sound beyond what you would expect from a two-piece group. The alt rock band cites Taking Back Sunday, Two Door Cinema Club, and MGMT and their biggest influences. Ace Bandits released their first EP, Subtle Expressions, in 2013 and plans to release their first full album by the end of the year. At the end of 2015, the duo recorded a music video for their single Silence Said It All. Ace bandits have played shows all over Southern California, including venues like the Foundation Room at the House of Blues and The Knitting Factory. You can follow Aced Bandits on Facebook for more information on future album releases and to stay up to date on their upcoming shows.